While I was wandering the rolls the other day, I came across this gem of an objective marker from 3+ FTW. Don't let the blog name confuse you, it's a smaller blog right now, but some of the best stuff can be found on the smaller sites that are focused on just sharing what they've done for themselves. 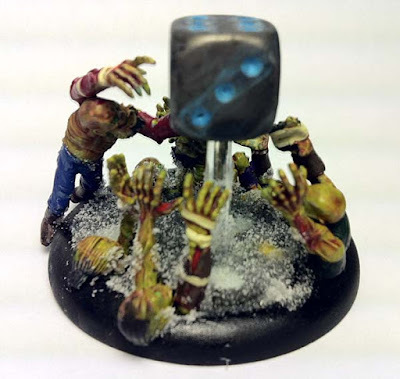 I don't know the specifics of the marker, but the idea of the zombies coming up out of the ground and reaching for the dice just seems so cool to me. I don't think it doubles as a turn counter though. Would be excellent if it could though. I've always thought making objective markers for your army was a great idea. Seeing someone take the extra time and put some effort into making something so small for an army always impressed me. I've only made one real objective marker that I can remember. I made it a while ago when I used to play more than I did anything else. I found it to be a way to tell a short story and give a little background to my army. You know, a reason to be fighting there. Of course the opposite of all this is to use a single D6 and just set in on the table. It might work, but it's not going to to win any awards or add much to the game in the end. I finally settled on making these markers that could glued down to wooden bases to simulate radar blips. This made it easy to come up with enough for both players to have what they needed for the game. So if you're one of those players who has custom made objective markers that add that extra little bit to both your army and the game, let me say thank you. Thank you for taking the extra time and investing it in the hobby. I've taken some of the links from the comments and added them here for additional reading. And something I completely forgot about was this little guy here. He comes from Secret Weapon Minis and is one of their swag items. 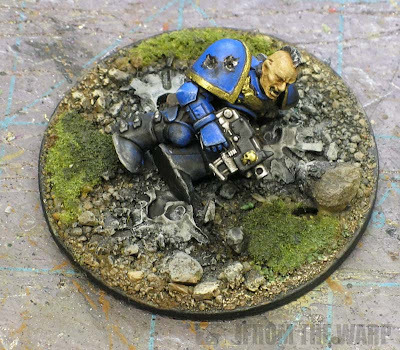 I can't really think of many "objective markers" for sale from companies, but it does give me an idea. With the amount of detail already present on most resin bases, who says you can't add a few more smaller elements to a base and call it done? It wouldn't take much I suspect, most of the work has been done with the resin base already. 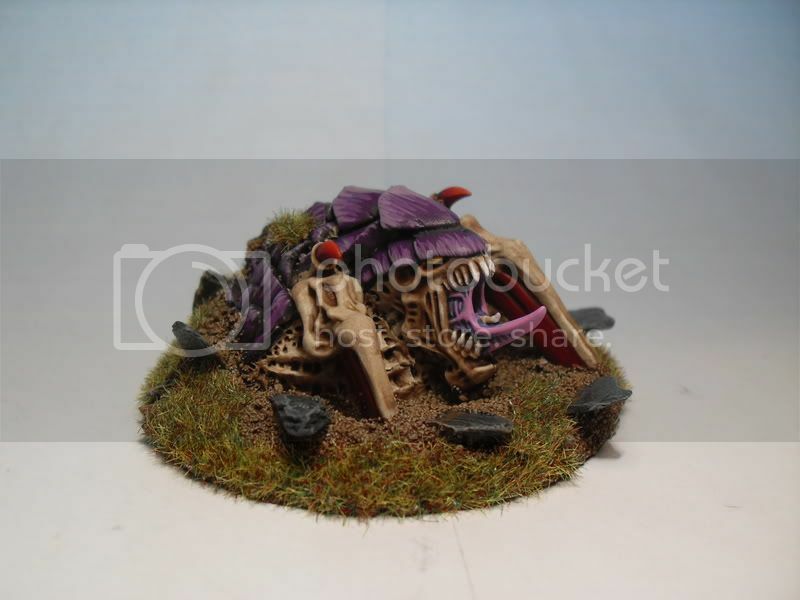 Just another element or two glued onto it and you've got something that matches the theme of your army perfectly. Whatever method you chose, if you've taken the time to go that extra bit, thank you. Objective markers are highly required in every match and so I simply don't understand why players don't build some. It's a lot of fun and you can be very creative. Big fan of going the extra mile with Objective Markers, it's fun, adds to your army, your game and just looks so much better on the table than your everyday die. 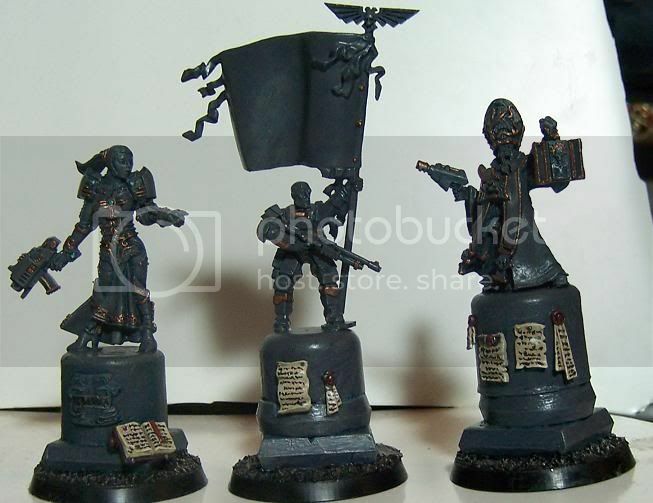 Nice idea, Hephesto - though I'd try to drybrush the statues with a slightly lighter grey, e.g. Codex Grey. That should add some more stone effect to them. The quality of my camera, or lack of quality, doesn't do them any justice I'm afraid. Perhaps I need to have a long sitdown with Santa this year to negotiate the term for a new one. Actually I am about to start making a few myself. I found a few articles on making some. The paper tarps are amazing looking and really simple. I priced out the barrels, very cheap and you can likely find them at a FLGS nearby! I make my own terrain boards, and when I make a new board I generally make a half dozen or so objective markers that fit that terrain. 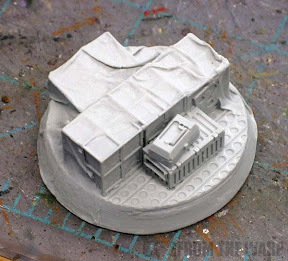 And I often simply use a resin base with a single element added to it as a marker. Sometimes no element at all, just the base. I try to have one or two markers (on 40-60mm bases) that "tell a story" and then four or five that are just an appropriate and thematic 25mm round. For themed WHFB boards I have made use of miniatures of unarmed civilians as objective markers. Villagers for a farmland board, princesses and courtiers for a "storming the castle" board, and "ladies of the night" for a urban themed rumble. And for a post-apocalyptic board I used mastiffs for all my markers. misterjustin: Perhaps some basic, non- army specific ones that anyone can use in a game. Gailbraith: I like the idea of using regular citizens for your WHFB markers. That's a great idea. Simple concept, easy to build and paint, and this one is somewhat versatile (I'd use it as an objective for either an Ork or Chaos army). Reuben: I remember that post. I added a link to it for others to see. It's suitably gory and not specific to any one particular force. Cheap to make too. Nice job. Hey Ron, Thanks again for the plug. Caterpillar: Thanks for posting and sharing the pics with me!